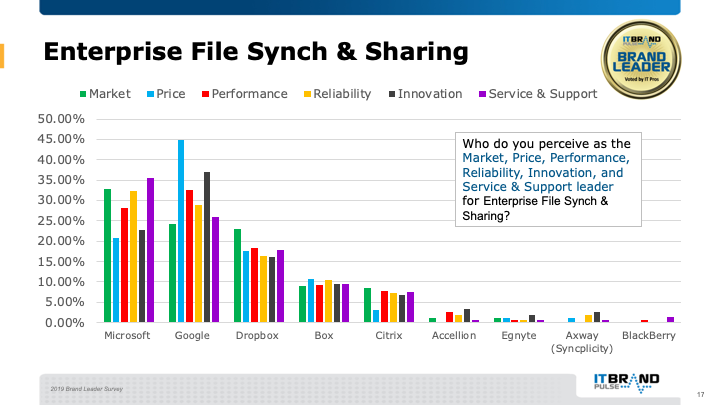 Enterprise File Synchronization & Sharing: EFSS refers to a range of on-premises or cloud-based capabilities that enable individuals to synchronize and share documents, photos, videos and files across multiple devices, such as smartphones, tablets and PCs. Microsoft took control as Market leader as well as Reliability and Service and Support. Google, second place Market leader (last year’s Market leader), was named Price for the fifth time in as many surveys while also claiming Performance and Innovation. Dropbox came in third respectively.